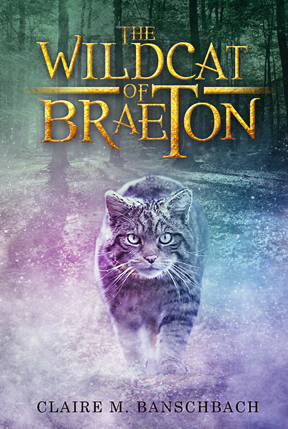 Today I have the opportunity to introduce you to a new and upcoming book, The Wildcat of Braeton by Claire Banschbach. Today, we have a character spotlight about one of the main characters. “If you’re fighting our battle, we’d best make you look like a champion,” Tam said to Aiden. Tam and Blair began to apply the war paint the Clans had worn into battle since before they arrived in Braeton. “You ready?” Tam asked when they finished. Claire Banschbach was born and raised in Midland, TX, the fourth of eight children. She was homeschooled through high school and is now a proud member of the Texas A&M University class of 2014. An avid reader of Lord of the Rings, Narnia, and many other adventure novels, Claire was prompted to begin writing her own fantasy novel at seventeen after several years of daydreaming. She continues to write in her spare time (and often when she doesn’t have spare time). When not scratching out stories and homework with pen and pencil, Claire partakes in the joys of watching the Boston Red Sox, Aggie football, playing volleyball, and horseback riding. She hopes her faith and strong foundation in God will continue to help guide her writing. She is currently working on her Doctorate of Physical Therapy at the Texas Tech University Health Science Center. Aiden is the third son of Laird Gordon, chief of Clan Canich of Braeton. He ran away from the Clan when he was sixteen after clashing with his father on numerous occasions; their headstrong and fiery personalities resulting in this almost continual conflict. He travelled south to the coast of Aredor where a friendly merchant gave him passage to the western country of Gelion. There he became a squire in a governor’s palace in a coastal town. It was there that he learned to use his distinctive double swords. An unfortunate accident in the training ring and an ever-growing desire to see more of the world prompted him to travel again, this time embarking on a voyage to the southern country of Calorin. Not too long after reaching Calorin, he found himself in a tight spot, brought on by his temper and some unfriendly Calorins. A Lord Rishdah resolved the situation and brought Aiden into his service. Aiden served in Lord Rishdah’s army for a year before tragedy struck again in a battle, killing a close friend of Aiden’s. This caused Aiden to begin curbing his temper and struggling to control the berserker’s rage that haunts him. Shortly after, he joined the elite Phoenix Guard of Lord Rishdah. During that time he took a Calorin name – Emeth. Seven years later, he would finish his term of service to Lord Rishdah and begin a journey back to a home that he will find is very changed from when he left ten years before. Foreigners threaten his Clan and the safety of Braeton. It falls to Aiden to stop them before his family and country are destroyed. Due to circumstances beyond my control, the release date has been moved to (most likely) May. However, if you feel that you cannot live without this book, you can buy it here- https://www.tatepublishing.com/bookstore/book.php?w=978-1-68097-981-7 Warning- it costs about a hundred-million dollars (or I’m a poor college student and anything over $20 is expensive), so I would wait until its official release date and you can shop more cheaply! Stay tuned on my Facebook page or blog for more info on the release date! Opens at midnight March 23 and closes at midnight on March 28. Giveaway includes 2 signed copies of The Wildcat of Braeton and accompanying sets of four notecard sized illustrations from the series! Claire M. Banschbach –Thoughts and Rants – Meet the Characters!